Ms. 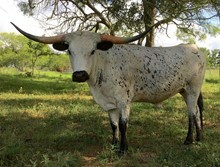 Crystal Gayle is one of the first cows we raised and official madam of this Texas juke joint. She’s a daughter of The Shadow and passes on her long, stout, correct conformation to her calves. 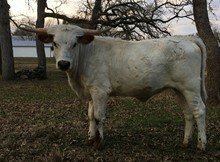 She’s a beautiful pale roan and has magnificent, heavy, sweeping horns that are just over 70”. 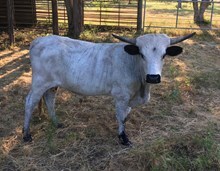 Gets pregnant faster than a cheerleader and raises a big correct calf with loads of horn, always black and white or roan. Excellent mother, eat out of your hand gentle and very easy on the eye. Hard to tell she’s my favorite. 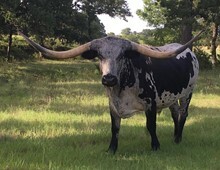 Wish we had a whole herd like this one.